Do you own an e-reader? When I first got my Nook I planned on using it for casual reading. I downloaded many of the free classics on Barnes & Noble. Eventually, I came to realize that I could store my pdf cookbooks and crochet patterns for trips and quick reference. It took my children bugging me to use my e-reader for me to realize that it was a perfect tool to use in our homeschool. We have always used free ebooks to supplement our learning, Usually, I would print off the book one chapter at a time. This used up so much ink and paper, however, that it limited the number of books we could use. With an e-reader, we could take our books anywhere! If we really needed to print a page or a picture from the book we still had that option on my computer. The storage capabilities on my e-reader allow me to have hundreds of books at our fingertips. We have the option of buying books online and having them on our Nook in a matter of seconds rather than waiting for shipping. I can also view any pdf file, so that means I can plan lessons on the go using files from Currclick, HSlaunch, and Ambleside. E-readers are economically and environmentally friendly. It is estimated that if you replace just 22.4 books with your e-reader over its lifetime that you are saving energy and resources enough to justify the purchase of the electronic device. We have purchased several books in the e-format rather than buying the printed version. My college even has an option to buy electronic versions of the textbooks required for a class. There are several reasons I chose an e-reader over an Ipad or similar tablet. The e-ink technology on the Nook and Kindle makes reading for long periods of time easy on the eyes. There is no glare and no back-light. I also chose the e-reader because of the price and size. I have a smartphone and adding a tablet didn't make sense for us as I don't leave the house that often. When we travel, I have my Nook in my purse and my husband has his laptop. So how does one use an e-reader for homeschooling? There is such a variety of ebooks online that there really is no limit to the ways in which an e-reader comes in handy for homeschooling. We use free public domain texts for history, science, reading, art, and more. Our local library allows us to borrow ebooks from the state library website. We can also preview thousands of Barnes & Noble books on my Nook either through their site or by visiting our local store. If you are on a budget for homeschooling materials, you could easily have a curriculum of free ebooks. There are entire websites dedicated to homeschooling for free through the use of ebooks available online. There is a difference between a scanned book and a digitized book. This blog post does a great job of explaining the difference, and how that will affect your e-reader. Know what format is the best for your e-reader. When you are downloading at Many Books and Gutenberg you will have a list of download formats. Kindle format is (of course) for the Kindle. If you have a Nook you will want the Epub format. If you have another brand you should check with the manufacturer to see what formats are supported and which are the best. Have a designated folder for your downloads. If you will be downloading a lot of ebooks to add to your reader you want to make sure that you can find them easily. I have a folder for newly downloaded books and a folder for books that I have already added to my Nook on my external hard-drive. When purchasing an e-reader, know what options you want. 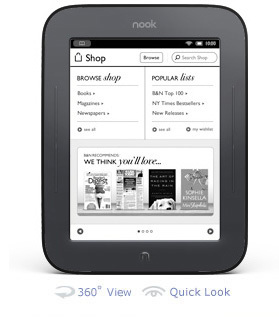 I personally chose the Nook for the touch screen and the ability to add an SD card for more storage. I didn't really need the 3G capability but it is nice to have. If I were to buy an e-reader for my kids I might go with the new Kindle Fire because a lot of kids books are color and the color Kindle is less expensive than the Nook color. There are other brands of e-readers but I wanted to stay with a major company that I knew would carry ebooks for purchase on their website.